Messe Nuremberg exhibition hall receives award! 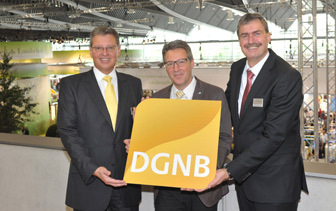 Messe Nuremberg’s Hall 3A has become the first exhibition hall in the world to receive the German Sustainable Building Council’s (DGNB) highest category of excellence (the Gold standard). The DGNB certificate combines economic, technical and ecological parameters and aspects of sociocultural sustainability. According to Messe Nuremberg, the reasons for this high degree of recognition lie in the comprehensive sustainability concept used in the construction of the exhibition hall. The heating supply for 3A is climate-neutral thanks to the use of district heating, rotary heat exchangers and LED lights. These factors ensure that excellent conditions prevail on all exhibition stands in addition to excellent potential for energy saving. As one of the UK leaders in environmentally friendly exhibition stands, we applaud the team at Messe Nuremberg for achieving this milestone. We encourage all of clients to look at the wider environmental impact of their exhibition programme including transportation, exhibition storage, recycling and the use of eco-friendly inks. If you’d like to talk about your own exhibition management programme and how 200m2 can help, call us anytime on 020 333 200 92.